In 1846 the original monument company was started on Elm Street in Skowhegan by W. A. F. Stevens. It was purchased August 15, 1853 by Harrison Baker and Charles C. Emery. Charles C. Emery was from Waldoboro where he had been associated with a monument business. Harrison Baker had joined the gold rush to California in 1849 and possibly made the first gravestone from California marble during his stay there. It is said that he received the fabulous sum of twenty dollars a day for his work there. The shop was moved to the Washington Hall building in Skowhegan where it remained until the business ceased in 1960. Mr. Emery sold to John F. Judkins in 1863 and the firm became “Baker and Judkins”. The partnership continued until 1906 when Mr. Baker sold to Edwin Warren Marble who operated the business until his death in 1916. Edwin’s son, Gerald Coker Marble, who was then a student at the University of Maine, purchased the business from the estate. In the early 1920’s Gerald C. Marble also purchased a granite quarry in Norridgewock. Gerald’s interests were divided between the quarry, the monument businesses and his profession of suspension bridge construction. The business ceased in 1960, after more than 100 years of continuous operation. Gerald C. Marble died in 1972. Mrs. Priscilla Marble, widow of Gerald C., graciously presented the record books of the firm, spanning over one hundred years, to the Maine Old Cemetery Association [hereinafter referred to as MOCA] in 1976. After much discussion and recognizing the need to preserve this valuable historic information, MOCA, with the approval of Mrs. Marble, turned the collection over to the Maine Historical Society [hereinafter referred to as MHS] in Portland, Maine for permanent preservation. The first record book is dated April 15, 1855. The firm originally recorded the information chronologically. The method of recording changed at the beginning of 1918 to alphabetical entries. The original record books remain at the MHS, where there is a partial card index compiled by MOCA volunteers. In 1999 MOCA made arrangements with the MHS to obtain a photocopy of the record books and was granted permission to make two additional copies. The records were then computer indexed by Carolyn Ballantyne for MOCA and compliment these volumes. 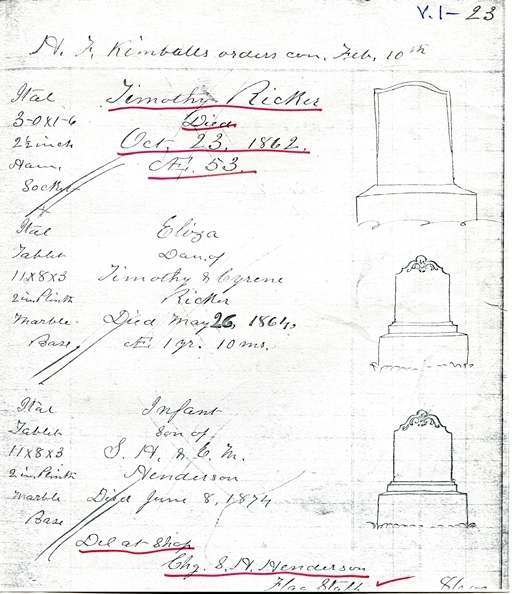 The computer index includes, where the information is given, the name of the deceased, the name of the cemetery and the town where the stones were set as well as any other names associated with the order. Maiden names of spouses are cross-indexed. Occasionally there were orders for other engraved or carved work which are also included in the index. After you find the name you're researching in the Marble Index, you can request a copy of that page from any of the above libraries. As a service to MOCA, they will provide up to 10 pages of data free. Please do not ask them to do your research for you as this is not a part of our agreement.